Did you know that your office desk reveals a lot about you? You can create an efficient and productive work environment with our wide range of office desk furniture and accessories. 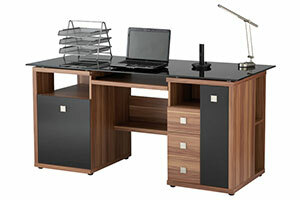 OfficeRock.com is one of UAE's largest online suppliers of office furniture and stationery. Executive wood desks, and more! Choose designs that are stylish, elegant, and functional. Our wooden office desks are made from natural wood or resilient laminates and are sturdy enough to last for years. You can match your new desk with one of our executive chairs, including scratch and spill-resistant models. All of our products are guaranteed genuine and durable. We'll deliver it anywhere in the UAE, including Abu Dhabi and Dubai. We can even customize products to match your personal requirements. Call us, ping us, or fill in the contact form to request a meeting. One of our staff will be at your home or business to discuss your needs.